Kiss Your Mother Goodbye The true story of Kathy Walkup and her family Imagine your children going to the movies with a babysitter and not coming home. Imagine losing three of your four children at the hands of a drunk driver. 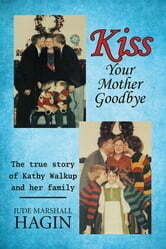 This is the 1979 story of the Walkup family. This is the story of how the parents of four beautiful children lost almost everything and found a way back from the brink of despair and went on to have two more children in spite of their unbelievable loss. The one surviving child made them live for each other and their future. A future that involved reversing a vasectomy while caring for their surviving injured son. Their unshakable faith prevailed. If you must drink and drive, please kiss your mother goodbye. What's the Number for 911 Again? Was Jimmy Cursed or Blessed?